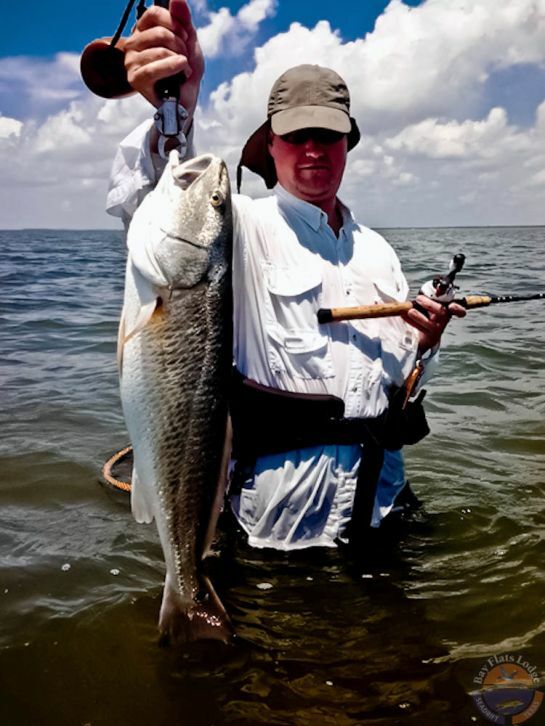 Aside from the sometimes extreme heat, our Texas shorelines offer some really great fishing fun during summertime. It's this time of the year when one of my very favorite types of fishing generally turns on strong around here – shell. Fishing the many shell pads available in San Antonio Bay (SAB) during late June, July, and even into August can simply take your breath away, especially for anyone who may not have ever experienced it. You can't always fish the SAB reefs due to the presence of strong winds, but when you can you need to get out there as early in the morning as possible for a variety reasons. The first being that it's simply much more comfortable during the early morning hours – you get to beat the heat. Another is that you'll also beat the crowds by showing-up extra early on the reef where you wish to start your day. And a third reason I like being on the reefs as early as I can is because the fish can a lot of times be found in very shallow water near the crown of the reef in predawn light because the water has cooled overnight. I'll often idle the boat up into waist-deep water on the opposite side of the reef that I wish to fish on. I'll get out of the boat and won't take more than ten or twenty steps before stopping to make my first cast. If I can see the ridge of the reef, I'll make my way toward it, but it might be beneath the surface a bit depending on the day's tide. I intentionally try to limit my steps because I know the sound of crushing shell beneath my feet is easily heard and travels a great distance underwater. As far as lures go, top water action can hardly be beat when it comes to having fun atop SAB's shell reefs. I'll start my day by throwing a black surface walker across the top of the reef in all directions during the hour before sunrise. Once the sun has risen, and if it is climbing into a morning sky that contains no clouds whatsoever, I'll then often change to a bright color like white, chartreuse, or even chrome in many cases. However, if there are clouds that appear as though they're going to be sticking around for a while, then I'll keep throwing the black lure, or I might try a bone-colored one. Now then, when the trout action heats-up on the reefs, I truly mean it really heats-up. When the trout are on the reefs, you'll generally know your destiny very early-on in the morning. If the hands on your watch are approaching 7:00am and you and your buddies haven't had a single strike, it may be time for you to look at your alternatives. At this point, the first thing I would do would be to try to locate a bite in one of the lower parts of the water column. I might try tossing a twitch-bait out to deeper water and work it back into the shallows, or just vice-versa. I'd also probably want to tie-on one of my favorite plastics and work it at different speeds up and down the spine of the reef and out beyond the drop-offs. And if you finally determine there to be absolutely no action to be found on the reef where you're wading, then pack-up and investigate other nearby reefs for positive signs of fish – active bait fish, birds flying or sitting on the water, fresh slicks coming off of the reefs. If the reef scene just isn't your thing, or if you're not able to get to the reefs due to heavy winds, then you might consider trying some of the back lakes that are situated all along Matagorda Island. The lakes most often offer protection from the prevailing summertime winds, and can often be counted on for a certain level of seclusion from a lot of other boats and anglers. The lakes commonly hold descent water and are prime places for targeting some large, bronze-shouldered red fish. I prefer to wade the lake areas, but their soft-mud floors can often make wading extremely difficult. So, don't feel bad about drifting the lakes, or even anchoring in a preferred spot. I've done it all back in the lakes, and have caught fish in each scenario. One method of boat fishing that I like doing in the back lakes is fishing the drains. I'll oftentimes position the boat to one side of the mouth of a small cut or bayou at the beginning of an outgoing tide – when water is being pulled-out of the lake through the cut, or the bayou. These are great ambush points for trout and red fish as they hunt for unsuspecting baitfish and other marine life to be emptied out of the lake. But regardless of whether I'm fishing atop shell reefs, wading a protected shoreline, floating a back lake, or venturing out into the surf, there's still just one word to describe summertime coastal fishing in Texas – FUN! With summer upon us, I remind you, your family, and your friends of the importance of applying plenty of sunscreen first thing in the morning, and to wear long-sleeved shirts and full-length pants. And don't forget to drink plenty of fluids throughout the entire course of the day, particularly those which are non-alcohol content in nature.